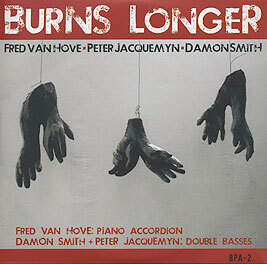 Fred Van Hove, piano, accordion; Damon Smith, double bass; Peter Jaquemyn, double bass. Recorded on Easter Sunday 2008 at L'Archiduc, Brussels. Front cover (reproduced above) by Peter Jacquemyn.